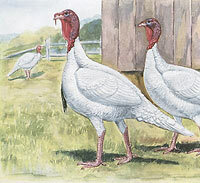 These broad breasted turkeys are the most popular. Easy to dress because of their white feathers, they also get the biggest. Our Nicholas strain hens reach 25 pounds and the toms as much as 45 pounds. Can iI order a mix of Broad Breasted Bronze and Giant Whites to get to 15? 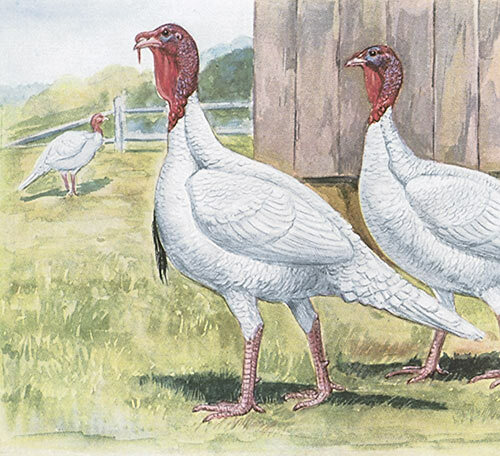 Yes, you may order a variety of turkey breeds to reach the 15 turkey poult shipping minimum. The giant whites are not able to reproduce on their own. Their breast is too large. Is it possible to mix an order of meat birds and a few turkey chicks? No, the minimum for chicks is 15 and turkeys is 15. They are not hatched at the same location so will not ship together. About how long does it take for them to reach butchering size. I want to butcher them for Thanksgiving, not sure when I should start them. They are normally full grown at 22 weeks. But they are typically butchered at 16 to 18 weeks depending on what size your looking for. Do Giant Whites breed naturally? Because of their large breast and heavy weight, it is difficult for Giant White turkeys to breed naturally. It is recommended artificial insemination. I have 2 giant white turkeys 5 or 6 months old. How can I tell if they are male or female. Males are larger in size and heavier in weight compared to females. Males will have larger beards. Females head will be smaller and more fine featured. Females will also be more vocal when picked up. Is there a minimum purchase on turkeys like there is on chicks? Yes. The minimum order for turkey poults is 15. HUGE BirdsWe ordered 15 and sold all but 3 chicks. Had one Tom and 2 hens. The Tom graced our Thanksgiving table, fully dressed, at 48.6 lbs. Monstrous bird, took forever to cook, however, he was very tasty, moist and fed a multitude of people. Only problem, before he met his demise, he was trying to mount the hens. He split one of the hen's thighs wide open as they're too big to breed. If you get them would fully suggest keeping the Toms separate from the hens. Will be ordering more come spring, however, I think they'll butcher out before we have to cook another 50lb bird. mixedI have only had them a few months, but had a few to die right away. Of the ones that are left 4 have developed leg problems and can hardly walk. I am hoping they will make it to butcher time but may have to do it earlier for the few stuggling.